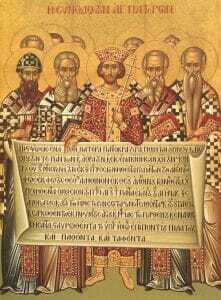 The First Ecumenical Council was summoned by Emperor Constantine the Great in 325, May 20th. The Council assembled at Nicaea in the province of Bithynia of Asia Minor and was formally opened by Constantine himself. The Council passed 20 canons including the Nicene Creed (described below), the Canon of Holy Scripture (Holy Bible), and established the celebration of Pascha (Easter). The main reason for its being called was the Arian controversy. Arius, a presbyter (priest) from Alexandria, held that Jesus Christ was created by God and denying Christ’s divinity. Arius argued that if Jesus was born, then there was time when He did not exist; and if He became God, then there was time when He was not. Arius’ original intent was to attack another heretical teaching by which the three persons of the Godhead were confused (Sabellianism). We (I) believe in one God. The Father Almighty. Maker of heaven and earth, and of all things visible and invisible. And in one Lord Jesus Christ, the Son of God, the only begotten, begotten of the Father before all ages. Light of Light; true God of true God; begotten not made; of one essence with the Father, by whom all things were made. Who for us men and for our salvation came down from heaven, and was incarnate of the Holy Spirit and the Virgin Mary, and became man. And He was crucified for us under Pontius Pilate, and suffered, and was buried. And the third day He rose again according to the Scriptures. And ascended into heaven, and sits at the right hand of the Father; and he shall come again with glory to judge the living and the dead; whose Kingdom shall have no end. Another important decision of this Council was the establishing of a calendar formula by which Pascha (Easter) ought to be celebrated. Pascha occurs on the first full moon following the spring equinox and following the Hebrew Passover feast. The Council also regulated matters of ecclesiastical importance regarding territorial and moral questions pertaining to both clergy and laity. One particular delegate, deacon Athanasios from Alexandria, proved the champion of Orthodoxy by his statements of faith and the draft of the Creed that bears his name. Another delegate, who by his eloquent argument against imposing compulsory celibacy on all ranks of Clergy prevented outright celibacy in the Orthodox Church, was Paphnutios, an Egyptian who had been a disciple of St. Anthony. He had suffered such hardships and cruelty during the persecution of Maximin that his mutilated body proved an object of veneration to the assembled bishops, and his recommendations were highly respected. The number of bishops who attended the Council was 318. Hence, this Council is also known as the Synod of the 318 Fathers. It closed on July 25, 325. 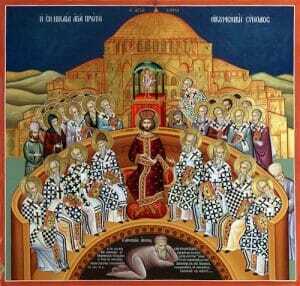 Their memory is commemorated by the Orthodox Church on the Seventh Sunday after Pascha (Easter). From: The Ecumenical Councils of the Orthodox Church, Adapted from an essay by the Very Rev N Patrinacos.